we are slowly but surely recovering from our holiday tree-trimming party! highlights from the even include crafty contributions from neighbours cassy and carol. and our new tradition, begun last year, the gingerbread smash. the kiddo was ready to smash the gingerbread house before any guests arrived, and cleverly suggested we take a picture to show everybody instead. hmm, no. it did survive most of the way through the party, but only barely. 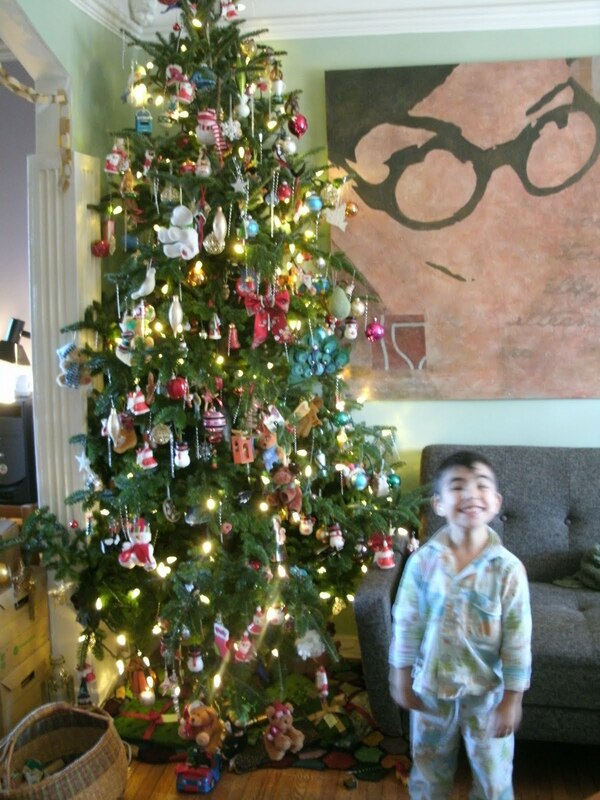 the next day was spent ignoring the need to do a post-party clean, and enjoying our newly-decorated tree. we also enjoyed the latkes i hadn't got around to making before the party. all hail my new best friend, the le creuset braiser! latkes, paella, rabbit rillettes, spatchcocked chicken... is there anything it can't do? sunday was also a time for knitting. i'm a bit behind (as ever), which i blame on party prep and forgetting how many pairs i need to do. but i've started on the second set now! whee! i nearly lost the pattern, as the kiddo is experimenting with typing, and typed a lot of Hs all over it. i am grateful he hasn't managed to save his edits yet. i will be posting the free knitting pattern soon! i'm hoping to squeeze in some quiet this weekend in between the traditional night out to see the nutcracker and the traditional watching of the apartment (the best xmas movie ever, which i just picked up on sale at indigo, yay) to get these suckers finished. wish me luck! I love your tree! Ours is decidedly "Charlie-Brown-esque" as we only have store bought decorations this year. And you're really making me want one of those braisers, stop it! get the braiser! it is the best thing ever. also, be warned: it is easy to go from "we hardly have any decorations" to "help, the tree is falling from the weight!"